The SwiveLock Tenodesis implants are designed for proximal biceps tenodesis. This efficient system was designed to save steps and minimise the length of the procedure. The implants feature a unique, PEEK forked tip that is used to steer the biceps tendon to the bottom of the bone socket without the need to externalise or whipstitch the tendon. There is no need to predetermine tendon length, as position and tension are easily set and visualised prior to final anchor insertion. Strong fixation is obtained by simply advancing the preloaded SwiveLock Tenodesis Screw. The forked tip SwiveLock Tenodesis implants are available in BioComposite and PEEK materials and in 7, 8 and 9mm diameters. The system also features Piloted Headed Reamers with built-in guide tips that eliminate the need to ream over a guide pin. 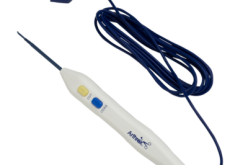 Both the implants and reamers are provided sterile for convenience and efficiency. For further information or to request a demonstration please e-mail rachel.leach@arthrex.co.uk / stephen.smith@arthrex.co.uk.